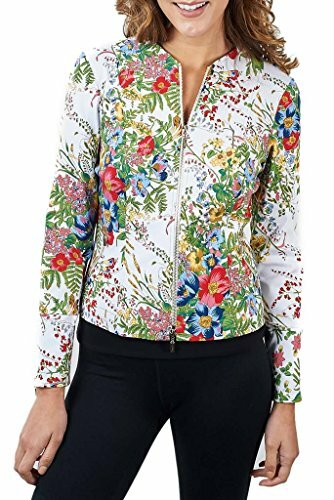 Joseph Ribkoff has designed this jacket with a spring flower design, zipper closure, two functional side pockets, and full length sleeves. Beautiful white jacket with floral all over print. Full length sleeves, and a full front zip. Two functional side pockets, 1 per side. 21" length, with a 24" sleeve length and a 30" bust on size 10. Hand wash in cold water, no chlorine, hang to dry, do not tumble dry, do not iron, do not dry clean.